Providing affordable and sustainable benefits is a primary goal for employers that offer prescription drug coverage. Recent press and public scrutiny over rapidly rising drug prices has revealed the struggle many plan sponsors experience in their efforts to achieve that goal. It is not a secret that annual drug price inflation has been happening for years. So, why are more headlines focused on this issue, and what can employers do about it? As with most drug issues, the answer to those questions involves the 4Ps: Patients, Payers, Pharmacy benefit managers (PBMs) and Pharmaceutical manufacturers. Drug manufacturers and PBMs have been publicly playing the price hike blame game as patients become more exposed to those prices due to plan design changes set by the payer. Due to growing pharmacy spend and trend, many employers now offer high deductible health plans (HDHPs) with the intent to promote consumerism among plan participants, with about thirty percent of covered employees enrolled in HDHPs as of 2016. The downstream effect of having a patient pay 100 percent of the drug cost every month until the deductible is hit has caused an influx of calls to benefits departments whenever a significant change in monthly prescription pricing occurs. This is also true for plans that require coinsurance percentage payments for dispensed prescriptions as opposed to flat dollar copayments that by nature mask the impact of inflation. As far back as last century, the annual average price inflation for all brand name medications was around 8 to 10 percent every year, while the net price after discount and rebates was about a percentage point lower. That all changed in 2013. 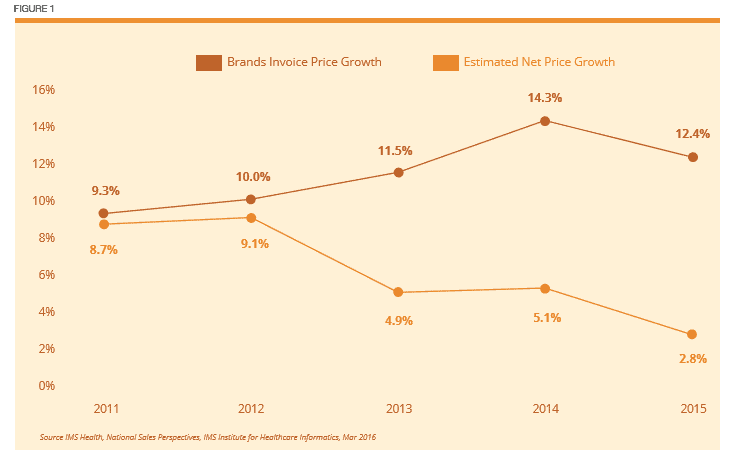 Responding to client pressure on annual price inflation, CVS/caremark became the first PBM to exclude drugs with therapeutic alternatives to drive larger rebates and reduce the net cost to the payer. The following year, in 2014, Express Scripts followed suit. Now with OptumRx on board, the three largest PBMs that make up roughly 75 percent of all drug claims offer exclusions on their standard formularies. It is no coincidence that average price inflation has ranged from 12 to 14 percent since the exclusionary strategy has been rolled out, but the resulting substantial increase in rebates has reduced the average net price growth to 3 to 5 percent annually. (See Figure 1). With effective contracting, employers should be utilizing those savings to help mitigate the growing trends, particularly in diabetes and specialty pharmacy where inflation is more rampant. For the drugs that elude exclusions and remain on formulary, the cat-and-mouse game between drug makers and PBMs continues to play out. Unfortunately, it is not uncommon to see preferred brand drugs rise annually by double-digit percentages, especially those with generic or biosimilar competition approaching down the pipeline. This has led to contracted terms for about 90 percent of drugs between PBMs and manufacturers to set annual price increase thresholds that, if exceeded, would result in payments back to PBMs, which should then be passed back to the payer in the form of rebates. This is known as ‘Price Inflation Protection’ and pharmacy benefit contracts without it are leaving dollars on the table. One question that continues to come up is who is benefitting from drug price inflation? At a high level, half of the 4Ps are feeling the brunt of price hikes, which would be the patients and payers, while the other half point fingers at one another. Pharmaceutical manufacturers state that the price increases are necessary to provide the larger rebates to PBMs with exclusions in order to gain market access, while PBMs point out that drug makers are ultimately the ones who set the price and determine how much to increase it throughout the year. It is important to note that not all manufacturers are created equal, and a few have publicly stated price inflation would be limited. Some manufacturers have tainted the image for all due to large price hikes after purchasing the marketing rights to drugs they did not even spend the research dollars to discover, such as Gilead did with Sovaldi. A closer look at publicly reported annual profit margins over the last few years shows a range from 15 to 30 percent for most manufacturers, while the major PBMs are around 3 to 5 percent. That is not the only factor to consider and does not mean drug makers should not profit off the drugs they develop, but there appears to be room to limit increases to low single digits before public pressure leads to government intervention. INSTEAD OF digging further down the rabbit hole on why price inflation is occurring, let’s touch on a few things plan sponsors can do to minimize its impact. >> FIRST, the importance of solid contracting terms cannot be understated. If given the opportunity, some PBMs will not pass through rebates received from drug makers to the payers without explicit language in the contract. These terms may be tough to receive for small-to-midsize employers, so collaborating with a group purchasing organization to maximize leverage could provide value. 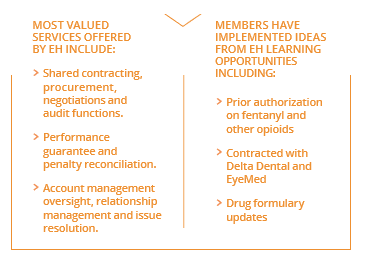 Also, be sure your consultant clearly understands pharmacy benefits and is independent and objective in order to obtain the best terms possible for your organization. >> BE ALERT and watch for plan changes that require immediate action. Some PBMs offer formularies that will exclude drugs that excessively inflate prices over a certain threshold, also known as hyperinflation. Even if your PBM does offer that formulary, prior authorization (PA) can be an effective tool to steer patients to less costly therapeutic alternatives, and this does not apply only to brand drugs. For example, some generic versions of extended release metformin have inflated to over $1,000 for a month’s supply while one version remains around $20 to $40 per month. A simple PA to ensure the pharmacy technician grabs the lower cost medication can lead to substantial savings. >> SET UP a more restrictive formulary that only allows brand drugs when no generic alternatives are available in specific therapeutic classes. This eliminates the brand price inflation that is often seen with me-too drugs and combination products. Until recently, the U.S. pharmaceutical market has left the door open for regular drug price hikes with little oversight and caused growing concerns over unsustainable benefits. As more public light gets shined on price inflation, we will likely either see those responsible police themselves or force the politicians at the state and federal level to intervene. Before that occurs, or if the status quo remains, it is essential that payers protect the plan as much as possible from the largest driver of pharmacy trend by partnering with trustworthy supplier partners.